Concentric plc. the world's leading manufacturer of oil, fuel and water pumps for medium to heavy diesel engines, has opened a full-scale manufacturing facility in Suzhou, China, mid-way between the two major industrial centres of Shanghai and Wuxi. The new factory started oil pump production in March 2007 following the installation of facilities that were completed at the end of 2006. The plan is to manufacture a full range of oil, water and fuel transfer pumps for both the Chinese domestic market and Concentric customers globally. In addition the company will also manufacture integrated front cover assemblies and lubrication pumps for transmission and reciprocating compressors. Total area of the new complex, including administrative block and factory buildings, is approximately 40,000 sq ft. 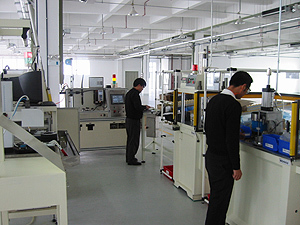 It is equipped with a wide range of assembly and test equipment, all of which is automated or semi-automated and poke-yoked, to ensure that product leaving the factory is defect-free. All equipment has been sourced locally to ensure a competitive market position and the whole plant benefits from a total preventative maintenance and continuous improvement regime. CNC machines will be added in late 2007 when the plant starts to manufacture fuel pump, ensuring the tight tolerances that are required to achieve the most exacting design criteria. Mike Attwood, Managing Director of Concentric China, commented: "The company has been established in China for several years now, first as a procurement operation and subsequently as a sales and engineering centre with pilot manufacturing facilities. We have built up a highly skilled team of European and Chinese engineers during this period, while also accumulating considerable experience in the Chinese market." "As a result, the new factory benefits from the existence of an established supplier base and the fact that systems are already in place to ensure production quality and on-time scheduling. The new factory and its suppliers are working to the same high level as other Concentric plants around the world as well as to recognized international standards. Both internal staff and our suppliers are trained to these standards, fully understand their importance and have already proven their ability to sustain best practice in terms of quality, delivery and service." Concentric China is a subsidiary of Concentric plc, a major supplier to the world's, truck and construction equipment industries with plants in the UK, USA as well as India. The group centre of excellence for design, development and engineering is located in Birmingham, UK.